Instantly digitize your hand-drawn, scanned or imported artwork. Then edit your designs down to the stitch. You can even draw your own stippling and choose to quilt in or around designs. The Destiny II large touchscreen measures 10.1″ diagonally and is comparable to many popular tablets. Every button is bigger and clearer, and all designs and stitches are vivid. Positioning stickers are great for smaller designs in tight spaces such as collars and pockets. Just place a sticker where you want your design… even if it’s hooped a bit crooked, it will be embroidered exactly where you want it! Tailor your machine to any task. 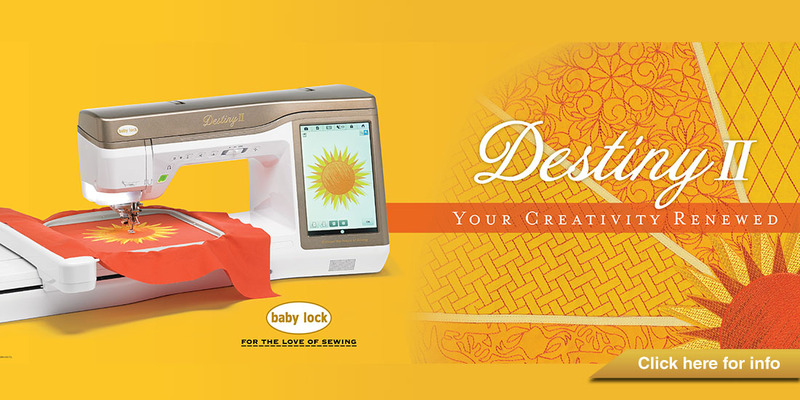 Destiny II comes with five embroidery hoops and grids ranging from 4″x 4″ up to 9.5″ x 14″.